Tahiti Travel Mate is owned and operated by Alison Adam, a Tahiti Tourisme Commission certified travel professional with over 25 years’ experience. Ali has crafted a range of suggested itineraries for Tahiti honeymoons, anniversaries, weddings, spa retreats, diving, cruise and well deserved Tahiti vacations.These itineraries focus on the best combinations of Tahiti including Bora Bora, Moorea, Taha’a, Huahine, Rangiroa and many other Islands in French Polynesia. Specializing in travel to the Islands of Tahiti, her knowledge of French Polynesia is unprecedented with her personally visiting the country numerous times. As Ali’s client reviews suggest, she has earned a reputation for providing top-quality service with a scrupulous attention to detail. Tahiti Travel Mate is fully licensed, certified, insured and Ali is ready to prepare your trip to paradise! WOW, we are loving French Polynesia. Our wedding on Moorea was PERFECT. It was so beautiful... Thank you again for everything! Everything was handled so professionally by Alison and our trip went very smoothly. I knew so little about Tahiti at the planning stage and I can't imagine having been any more pleased with the way our trip turned out. We enjoyed working with you, and felt you were not just a travel agent... but a friend helping us have the best vacation possible. Thank you for a great trip. Everything was flawless. Thanks again. We will be in touch next year. Could you help us plan a vacation to Australia? Where do I begin, well let's start with THANK YOU, THANK YOU, THANK YOU!!! I can't thank you enough, for all you did. I was in awe of how smoothly everything transitioned. Our Tahiti Honeymoon Packages below offer the best combination of luxury Tahiti Honeymoon escapes in romantic French Polynesia. Beautiful settings across Tahiti including Bora Bora, Moorea, Taha’a, Huahine, Rangiroa and Tikehau. Our Tahiti Vacation Packages offer an excellent selection of Tahiti vacation experiences including Bora Bora Vacations, Moorea Vacations and Taha’a Vacations experiences. Our Tahiti Package Specials offer the best combination of Tahiti Special offers to Bora Bora, Moorea, Taha'a and the islands of Tahiti. 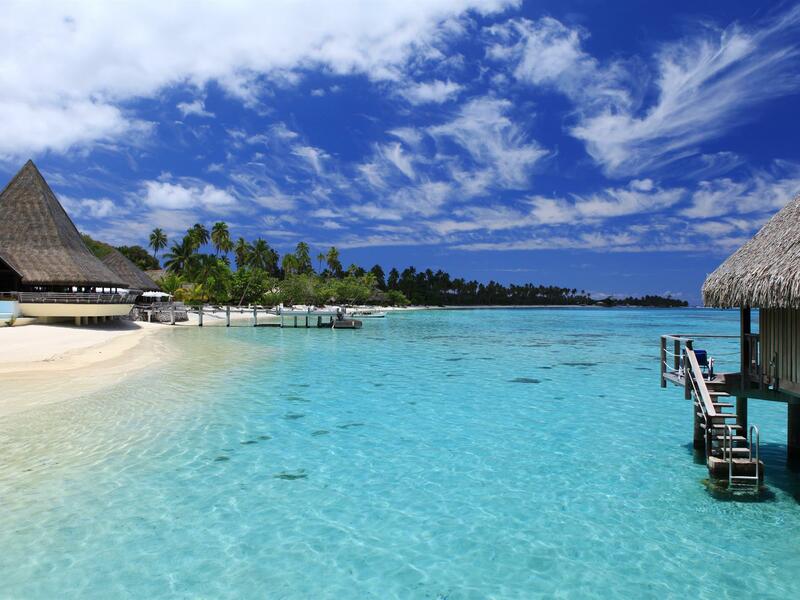 Includes a 4 night stay at Bora Bora’s best value, full service resort! Tahiti: Queen of the Pacific. A circle of majestic peaks crowns the island of Tahiti, towering over the ocean like a proud and royal Queen. Tetiaroa: the Birds Island. Beyond its breathtaking beauty, Tetiaroa is a place of rare biodiversity and a natural sanctuary for birds and marine life. Preserving and protecting this rare habitat and its plant and animal life is critical. Among this set of 13 “motu” islets, Tahuna Iti: the birds’ island is considered a natural reserve for sea birds who favor this place for breeding purposes and are observed by discreet visitors. A few minutes from the island of Tahiti by plane, and only thirty minutes by high-speed catamaran, Moorea soars magically out of the ocean in an explosion of green velvet - what you would imagine a South Seas island to be. Under a one hour flight from the island of Tahiti or Moorea, the island of Bora Bora, with a lagoon resembling an artist's palette of blues and greens, is love at first sight. Raiatea, meaning "faraway heaven" and "sky with soft light", was first named Havai'i after the homeland of the ancient Polynesians and is the most sacred island in the South Pacific. Taha'a, with the rich aroma of vanilla lingering heavily in the air, offers a glimpse of the traditional, tranquil life of the Tahitians. Rangiroa, a string of coral encircling a luminous turquoise and jade-green lagoon, is one of the world's greatest dive destinations. Tikehau, a graceful oval crown of pink-sand beaches, can only be described as a picture postcard. Considered to be one of the most beautiful atolls in Polynesia, the fragrance of the air is matched only by the abundance of life in the bright-blue water. The friendly people, their homes awash with gardens, invite you to share and explore their world beyond imagination. HIVA OA - PAUL GAUGUIN’S ISLAND: This majestic and historic island is known for its wild, untamed landscape, giant stone tiki, endless and unearthly vistas, and as the final resting place of poet Jacques Brel and artist Paul Gauguin. Over one thousand miles southeast of Tahiti are the Gambier Islands. The cradle of Catholicism during the nineteeth century following the arrival of the first missionaries to the region, hundreds of stone buildings from that era survive including churches, convents, schools, and watchtowers. Hundreds of miles to the south of Tahiti lie the Austral islands, a chain of five high islands located on the Tropic of Capricorn.